What do you get when you combine a tabletop game with an iPhone? 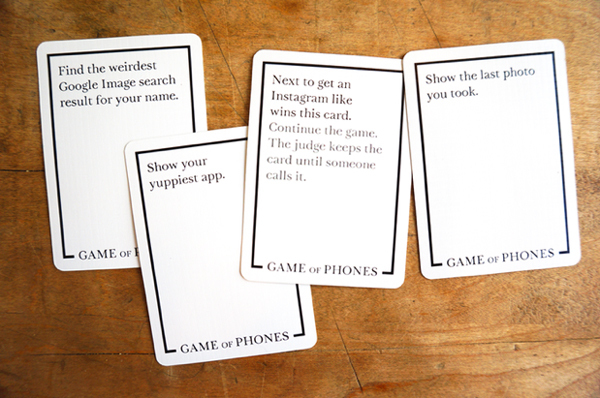 A new Kickstarter project, Game of Phones, is looking to answer that question. One player picks a card and gets to judge that round. They read the prompt to everyone else. Something like ‘Find the best #selfie’ or ‘Show the last photo you took’. Everyone finds something on their phones and shows the judge, who gets to choose a winner for that round. First to win 10 rounds is the overall winner. Heres a quick video about the game. Click here if you cant see it. A pledge of $25 or more will net you one pack of the game with 100 high-quality cards. If youre willing to give $100 or more to the project, youll receive a pack of cards in a custom, laser-engraved cherrywood box and a printed poster of the card back. With nine days left to go in the funding campaign, a little more than $3,000 has been pledged on a goal of $6,000. The game definitely sounds like a lot of fun, hopefully it will reach the funding goal. For recent news on other Kickstarter projects, see: Kickstart Glowdeck, A Wireless Companion For Your iPhone, Kickstarter: iMacompanion Puts A USB Port On The Front Of An iMac, and LifePrint Is A Wireless, Portable Printer Designed For The iPhone Generation.